Storm Lures is certainly an interesting company – their corporate motto is “Think Like A Fish.” They’re dedicated to truly understanding what makes fish take the bait, and how to best simulate realistic baits and appeal to huge varieties of fish with consistent, versatile products. For this reason, they offer one of the widest varieties of products that a single lure company makes – including hardbaits, hybrid baits, and softbaits. They don’t just focus on a single kind of bait because they don’t believe that all fish are attracted to just one kind of bait. Besides their versatile, varied offerings of bait materials, they also offer several unique innovations to set them apart from other lure companies, such as their UV Bright™ technology. This technology was created specifically to reflect more light than any other lure on the market, increasing the visibility of their lures by using a unique combination of optical brighteners, reflective surfaces, and fluorescent paints. That all adds up to a lure that’s bright and clear, perfect for punching through murkier waters, and for shining far and wide when the water is clear, and fish are feeding by sight. Their hybrid baits are perhaps their most unique of all – they incorporate softbody features like top-hooks that are stuck in the body, with long, flexible and rubberized tails, as well as hardbait features like rattle chambers, suspender hooks, and natural, realistic paint jobs. These lures are truly the definition of “more than the sum of their parts”, blending the best and most useful elements of both bait styles into a brilliant, versatile package, and are one of the many reasons that Storm Lures is making waves in the fishing industry. This lure by Storm is a perfect example of the hybrid style they’re known for. Made of a semi-soft, yet rigid and durable body, it comes equipped with a VMC needle point hook on the top ridge of the lure, and a VMC treble hook suspended from the belly, giving it plenty of holding power and angles from which it can snag your prey. It’s also created to be ultra-realistic, unlike some standard soft baits. The paint job is created with a naturalistic design that incorporates “flash-foil” where relevant, increasing visibility. It also incorporates Storm’s WildEye technology – 3D eyes that are purpose-built to be natural and convincing. These lures are especially good for larger bass and pike, but they come in smaller sizes for smaller lake or freshwater fishing. They are best fished with a steady cast-and-retrieve to take advantage of the natural swimming motion, which is aided by the soft, flexible rubber tail. And given their neutral buoyancy, they can be rigged to fall to whatever water depths you prefer. If you’ve never tried a hybrid lure before, this one is a great place to start. It truly combines the best of both worlds – the great paint jobs and belly-suspended treble hooks typical in hardbaits, and the soft, natural and convincing swimming action that’s usually only presented in softbaits. This swimbait from Storm sets itself apart from the pack in several ways. First, it’s created with an ultra-soft, yet durable body style, and cast and colored in over a half-dozen colorways that are versatile and convincing. This realistic body and soft design is complemented by a holographic foil finish and ultra-realistic 3d eyes. Second, it incorporates a bio-salt impregnated tail that attracts fish from far and wide with a mild salt flavor that won’t scare away more wary fish. They’re also pre-rigged with VMC nickel needlepoint hooks that provide a great hold, so you won’t have to worry about losing a fish after a bit, unlike some other similar softbaits. Third, the presentation of this lure is excellent. It’s a pretty small lure, weighing in at only .25oz, but it can really bring in fish with its natural swimming motion combined with the subtle salty scent that its tail gives off. They’re best fished in a steady cast-and-retrieve motion with plenty of side-to-side movement to really kick up water and augment the natural swimming motion – cast it as far as you can, and being reeling. Jerk your rod to the side and reel in, pause for a moment, then jerk to the other side, and repeat. Doing so creates an enticing presentation that is irresistible to fish. Because it’s so versatile and fun to fish with, we recommend sticking a few of these bad boys in your tackle-box. Coming in versatile colors, and at a relatively low price, you can nab one to use in any weather or water conditions, and once you start reeling them in with the WildEye Shad, you’ll never want to stop. 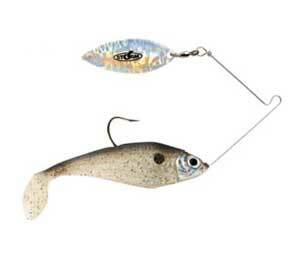 This lure is, simply, one of the most fun suspending jerkbaits we’ve ever used. 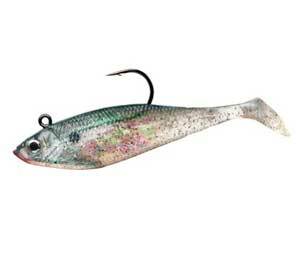 Unlike lots of jerkbaits that function best as a topwater lure, this one is specifically designed with a small lip and neutral buoyancy profile that lets you stick it a few feet deep in the water column, and get to jerkin’. Unlike many jerkbaits, it incorporates a crankbait-style rattlebox that contains multiple rattlers and makes plenty of noise and commotion under the water. Combined with its realistic minnow-style profile, 3D eye technology, and great paint job with external scaling, and the premium VMC black nickel hooks, and you’ve truly got a killer lure on your hands. As far as fishing it goes, it’s incredibly responsive, wobbling and shaking with even the slightest twitches of the rod, and it’s easy to make it dart back and forth, even at its max depth of about 6 feet. It’s best to fish it by casting it out and letting it sink to its maximum depth, and then moving it in small, horizontal dashing motions as you move up in the water column. Once you’re about a foot from the surface, let it sink again, and repeat. This method makes the wobbling and twitching presentation of this lure incredibly prominent, and allows the rattling BBs in the body to make maximum commotion, and bring in your prey. It’s hard to overstate how fun this jerkbait is to use. It’s incredibly responsive and effective. Some out there may think that jerkbaits are ineffective and boring, but if they rig up one of these lures, we think we could convince them otherwise. 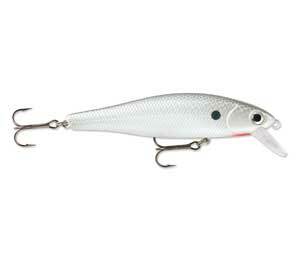 The Storm Smash Shad is one of the most versatile and fun crankbaits on the market today. This particular version, the 05, is a smaller offering which runs at a max depth of 5’, but other models can dive up to 12’, making this lineup of lures a great choice for all your midwater crankbait needs. It’s made with a realistic, UV Bright finish complete with visible scales and 3D eye technology for a flashy, yet natural look that really attracts fish, especially when combined with the explosively loud rattle and the rolling, lurching action that it picks up at high retrieval speeds. This lure isn’t just a high-speed retrieval or trolling crankbait, though – it maintains a great rolling action at just about all speeds, so you can feel free to jerk it around, rig it up to drop, or just keep it low and slow on the retrieve – it does it all. It’s durable, too – a high-quality plastic body pairs with ultra-secure VMC black nickel treble hooks to make a lure that can hold up to plenty of bites (and there will be plenty of bites). It’s just plain fun to use a crankbait this well made. Its versatility, and restrained, smaller design make it a must-have for smaller lake and river fishing. Who doesn’t love a spinner? Hint – it’s not fish – they go wild for this thing! This lure combines a high-quality, flashy spinner on one end with a three-pack of Storm’s Shad 03 soft plastic lures to place on the jig on the opposite side, creating a hybrid spinnerbait/swimbait that’s as effective as it is fun. The blade is built in a “willow leaf” design that pairs with a stainless-steel ball bearing that attach it to the rest of the lure, allowing unmatched, natural rotation and spin with the water to create a flashy presentation that can pierce through even the murkiest of waters. And on the other side, the Storm Shad 03 is built with a foil design that’s just as flashy, and incorporates a realistic profile, as well as Storm’s 3D eye technology, to create a spinnerbait that’s a cut above standard jig and grub offerings. And given the high-quality jig hook, you can rig it up with just about anything you want, once your Wildeye Shad supply runs out – skirts, grubs, worms, live baits – just about anything you can imagine. The high-quality spinner rig can take some real abuse and still hold up just fine, so you don’t have to worry about whether you’re going to lose your blade. You can just focus on reeling in the fish. There are plenty of other Storm Lures products – Topwater rattlers, suspenders, deep-trolling crankbaits, salt-impregnated softbaits, jigs, and even more, but we can’t go over all of them her. This article simply highlights some of their most versatile, interesting, and unique options, and we can safely say that Storm manufactures some lure styles that you simply cannot get anywhere else, such as their unique hybrid designs, and even their more traditional soft andhardbaits are top quality, and deserve a look if you’re stocking up on fresh lures before fishin’ season starts up in earnest.